Pakistan's Virtual University (VU) has won the Outstanding New Site Award 2012 for an Open CourseWare website which was created last year, according to media reports. The Awards for OpenCourseWare Excellence provide annual recognition to outstanding courseware and OpenCourseWare sites created in the OCW Consortium community. They also recognize individual leadership in moving the ideals of OpenCourseWare and Open Educational Resources forward. The awards are announced each year at the global OpenCourseWare Consortium's annual conference. In 2001, the Massachusetts Institute of Technology launched the world's first open courseware program, which inspired many other universities, including Pakistan's Virtual University, to join the Open CourseWare (OCW) movement. Founded in 2002, Virtual University of Pakistan has so far contributed 138 courses on a wide range of subjects since joining the OpenCouseWare consortium. These courses include free and open digital publications of high quality educational materials for colleges and universities. Enabling virtual education is the high-speed broadband expansion led by PTCL which has propelled Pakistan to become the fourth fastest growing broadband market in the world and the second fastest in Asia, according to a recent industry report. 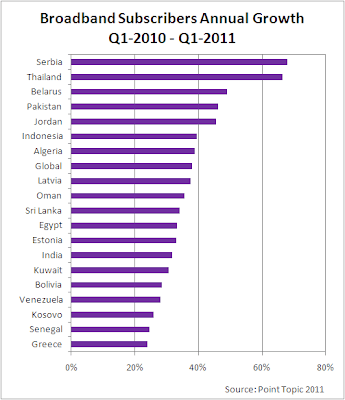 Serbia leads all countries surveyed with a 68% annual growth rate from Q1 2010 to Q1 2011. Thailand (67%), Belarus (50%), Pakistan (46%), and Jordan (44%) follow Serbia. India is in 14th place worldwide with a 35% annual growth rate. The quickest and the most cost-effective way to broaden access to education at all levels is through online schools, colleges and universities. Sitting at home in Pakistan, self-motivated learners can watch classroom lectures at world's top universities including UC Berkeley, MIT and Stanford. More Pakistanis can pursue advanced degrees by enrolling and attending the country's Virtual University that offers instructions to thousands of enrolled students via its website, video streaming and Youtube and television channels. The concept of virtual instruction is finding its way to K-12 education as well. 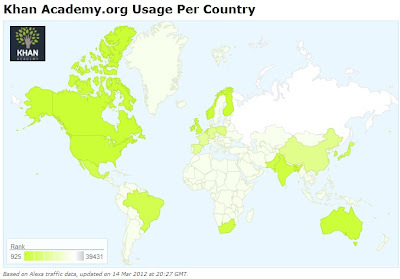 Increasing number of Pakistanis are drawn to the Khan Academy channel on YouTube making Pakistanis among its top users. Virtual Education for All is a local Pakistani initiative extending the concept to primary level. All of these technological developments and open courseware initiatives are good news for making education available and accessible to satisfy the growing needs in Pakistan and other emerging countries around the world seeking to develop knowledge-based economies of the 21st century. Virtual University deserves credit for leading this education revolution in Pakistan. VU is very good, especially if you are an Overseas Pakistani. USD 1000 per year, anyone can afford it. Very encouraging and heartening to know that Pakistan has achieved this honour. Pakistan's position at # 4 amongst the users of broad band worldwide is indeed creditable, is the data correct and checked by some well known authority? Tahir: "Very encouraging and heartening to know that Pakistan has achieved this honour. Pakistan's position at # 4 amongst the users of broad band worldwide is indeed creditable, is the data correct and checked by some well known authority?" The data is from The Broadband report which is considered credible and often quoted. It says the growth rate of broadband in Pakistan is the 4th highest in the world but Pakistan still has very low broadband penetration with just a couple of million subscribers so far. Did you notice how everything modern is set up in the Punjab? Shams: "Did you notice how everything modern is set up in the Punjab?" It doesn't matter where it's set up. It's after all a virtual university with courses produced in all parts of Pakistan which sit in the cloud at server farms which could be anywhere in the world and accessible to all comers. Khan academy is very famous in USA. Well done Salman. Online education is not new. The University of Phoenix started its online degree program in 1989. Four million college students took at least one online class during the fall of 2007. But, over the past few months, something has changed. The elite, pace-setting universities have embraced the Internet. Not long ago, online courses were interesting experiments. Now online activity is at the core of how these schools envision their futures. Many of us view the coming change with trepidation. Will online learning diminish the face-to-face community that is the heart of the college experience? Will it elevate functional courses in business and marginalize subjects that are harder to digest in an online format, like philosophy? Will fast online browsing replace deep reading? The doubts are justified, but there are more reasons to feel optimistic. In the first place, online learning will give millions of students access to the world’s best teachers. Already, hundreds of thousands of students have taken accounting classes from Norman Nemrow of Brigham Young University, robotics classes from Sebastian Thrun of Stanford and physics from Walter Lewin of M.I.T. Online learning could extend the influence of American universities around the world. India alone hopes to build tens of thousands of colleges over the next decade. Curricula from American schools could permeate those institutions. Research into online learning suggests that it is roughly as effective as classroom learning. It’s easier to tailor a learning experience to an individual student’s pace and preferences. Online learning seems especially useful in language and remedial education. In a blended online world, a local professor could select not only the reading material, but do so from an array of different lecturers, who would provide different perspectives from around the world. The local professor would do more tutoring and conversing and less lecturing. Clayton Christensen of Harvard Business School notes it will be easier to break academic silos, combining calculus and chemistry lectures or literature and history presentations in a single course. My guess is it will be easier to be a terrible university on the wide-open Web, but it will also be possible for the most committed schools and students to be better than ever. Having an immense potential to be an instrumental agent in Pakistan's economic growth, PTCL management has set high goals for its self since its inception and is growing every passing day. That the telecom giant of Pakistan is in transition is evident from the fact that it has posted yet another quarter of top line growth during the ongoing fiscal year. Most obliging fact being that during the latest quarter ending March 31, 2012, PTCL showed revenue growth of 11.3 percent and scored a net profit of Rs 1.4 billion. Its operation and effectiveness during the nine months ended March 31, 2012, is herald of business advancement and innovative farsightedness. With the garland of strengths including PSTN (fixed lines), wireless local loop, broadband, corporate business solutions, carrier and wholesale services, operations performance, information technology, human resource development market communication, customer care, quality and revenue assurance and international business. The company has firmly continued to grow in the emergent broadband market - both in wire line and wireless segments. With the 61 % growth in Broadband customers, respective revenues have grown and increased by 77 %. For the PSTN customers, introduction of various new packages commensurate with the needs of different segments of society as well as rationalisation of the tariff helped in increasing the landline usage thus arresting the revenue decline. Concurrently, PTCL group revenue turned up to be Rs 28.3 billion which is 9.7% higher as compared to the same period last year. Harmonising the corporate services also registered an increase of 5% in its revenues. Of this, PTCL's revenue was Rs 14.8 billion. Likely, continuing with its vision of providing quality services an increase of 9 percent in company's administrative expenses was recorded which is fair enough. Though Pakistan experienced the revolution of telecom industry in the last decade, PTCL has been working in this sector from its birth, which was many decades before from the revolution in the telecom sector; while during the last decade, other companies from around the world have jumped into the playing field with PTCL. In a bid to capture the lower end of the market, Nokia launched two new mobile phones — the Nokia 110 (Rs 3,800) and Nokia 112 (Rs 4,000) — in Karachi on Tuesday. Designed to appeal to “young, urban consumers”, the devices can be used to access Facebook, Twitter and other social media networks directly, or through the Nokia Browser. Additionally, Nokia 112 features a preloaded eBuddy instant messaging service. “Today’s mobile phone users want a quick internet experience that allows them to discover great content and share it with their friends – but without being held back by high data costs,” said Nokia’s Executive Vice President Mary T McDowell. “The new Nokia 110 and Nokia 112 devices combine browsing, social media, apps, world-class entertainment and long battery life,” she added. In each course, students post questions in an online forum for all to see and then vote questions and answers up and down. “So the most helpful questions bubble to the top and the bad ones get voted down,” Ng said. “With 100,000 students, you can log every single question. It is a huge data mine.” Also, if a student has a question about that day’s lecture and it’s morning in Cairo but 3 a.m. at Stanford, no problem..
Videoconferences have largely been confined to offices. Not anymore. New technologies developed by Polycom and other videoconference vendors let employees use smartphones and tablet devices join in no matter where they are. It's a "game changer" for Chris Plutte and his line of work -- using videoconferencing to connect students from countries around the world with students in American schools to help them better understand each other and the countries they call home. "This opens up a whole new opportunity for us. It's about access for us," said Plutte, executive director of New York-based Global Nomads Group, a nonprofit he co-founded in 1998 that is currently linking several schools in the United States with those in Afghanistan and the Democratic Republic of Congo for town-hall type meetings. "It's pretty amazing. In the past, students and schools that participated in our programs had to have a (wired) Internet connection. They needed to have a computer. They needed to have electricity," he said. "This is a game changer for us in that (videoconferencing) can now reach more rural schools in developing countries like Afghanistan and the Democratic Republic of Congo." "It's called the consumerization of IT," said Costello, the IDC analyst. "These devices are coming into the workplace." Total smartphone shipments worldwide reached 472 million in 2011, up 53 percent from 2010, said a Gartner report. Tablets are also growing, with Gartner projecting that by the end of 2015, more than 900 million will have been sold. "This is about the ability to connect to different types of people on different types of devices on any network. It's device-agnostic. You can have a smartphone connected to a tablet to a laptop to a high-end HD videoconferencing in an office," said Randel Maestre, vice president of worldwide industry and field marketing for Polycom, which is in the midst of moving its Pleasanton headquarters to San Jose by the end of May. "Our vision is to make video collaboration and videoconferencing ubiquitous," he said. Polycom isn't the only company with that vision. Last year, San Jose-based Cisco rolled out Jabber, a free downloadable application for smartphones and tablets that allows multiparty videoconferencing as well as access to voice, instant messaging and voice mail for existing Cisco customers. "Work is not a place you go to -- it's where you are at. You can work if you happen to be at the airport," said Michael Smith, Cisco's senior director for collaborative application marketing. "These mobile devices like tablets now give us the power to do videoconferencing even when we're not in the videoconference room." A combination of radio, television, and the Internet is used in distance learning institutes in Pakistan. Since 2004, when the government deregulated telecommunication in Pakistan, the sector attracted 54% of the total Foreign Direct Investment (PTA 2006). It is estimated that 10,184 hours of programming are broadcast annually on 3.6 million TV sets; the estimates for radio programming are four times this figure (Iqbal 2004). The Institute of Educational Technology (IET) established in Allama Iqbal Open University is a centre of media production. The educational audio and video content developed in IET is broadcasted on national television and radio channels. Virtual University of Pakistan operates four free-to-air satellite channels on which some of their lectures are broadcasted. Distance Education in Pakistan is dominated by Allama Iqbal Open University (AIOU), Asia’s first Open University, which was established in 1974 with a mandate of providing educational opportunities to the masses and to those who could not leave their homes or their regular jobs. In 2000, the Government of Pakistan developed a new initiative—the Virtual University of Pakistan (VUP). VUP was established specifically to create more capacity in the system by leveraging modern information and communications technologies. Even though VUP used ICT to deliver education through a distance learning mode, it was not conceptualized as an “open” university since AIOU already served that market (PANdora Distance Education Guidebook). Together AIOU and VUP serve 750,000 students (with an annual growth rate of 14%), which is three times the student population of all other universities in Pakistan combined (Ansari and Saleem, 2010). Due to the efforts made by the government as well as private and non-government donors, enrollment in distance learning institutes has increased from 199,660 to 305,962 from 2005-06 to 2007-08 (Economic Survey 2008-09). The man who drafted Pakistan’s first IT policy, Dr S M Junaid Zaidi, has been awarded an honorary Doctor of Science degree by Lancaster University in the United Kingdom, said a press release issued on Tuesday. Dr Zaidi, awarded the prestigious Sitara-i-Imtiaz in 2007, is the founding rector of the Comsats Institute of Information Technology (CIIT), which was chartered by the government in 2000 and has grown to have campuses in seven cities, over 20,000 students and 2,500 faculty members. Dr Zaidi’s professional experience spans 36 years, said the press release. His expertise ranges from devising Build-Operate-Transfer mechanisms to Technology Commercialization and Utilization, Project Planning & Management, Industrial Information Networking, Operations Research, System Designing, Technology Policy Analysis, Technology Monitoring & Forecasting and Technology Transfer. He holds a doctorate in Optimisation of Algorithms on Networking from the University of Birmingham in England. Before CIIT, Dr Zaidi served in many distinguished high profile positions at the United Nations (UN) and in the Government of Pakistan, said the press release. In his time with the UN, Dr Zaidi served as an adviser to the Malaysian government and later at the UN ESCAP Asia and Pacific Centre, where he was part of advisory missions to Fiji, Ghana, Indonesia, Malaysia, Nepal, Philippines, Sri Lanka, Tanzania, Thailand and Vietnam as a UN expert on IT and helped them establish their technology transfer and industrial technology information systems. He also wrote two concept papers for the government and Comsats, which led to the establishment of the Virtual University and Comsats Internet Services. .. Thomas L Friedman wrote in an article recently, “nothing has more potential to lift more people out of poverty — by providing them an affordable education to get a job or improve in the job they have. And nothing has more potential to enable us to reimage higher education than the massive open online course, MOOC, platforms that are being developed by the likes of Stanford and the Massachusetts Institute of Technology and companies like Coursera and Udacity.” Within one year, the coverage provided by Coursera has increased from 300,000 students taking 38 courses taught by Stanford professors and a few other elite universities to 2.4 million taking 214 courses from 33 universities, including eight international ones. According to another assessment, “enterprising academic institutions have taken the lead in online learning. Harvard and MIT, for instance, worked together to introduce EdX, which offers free online courses from each university. About 753,000 students have enrolled, with India, Brazil, Pakistan and Russia among the top 10 countries from which people are benefitting.” What seems to be happening is that while the government continues to neglect education, a variety of private initiatives are helping to fill some of the gaps that have been left. The new buildings will have all possible facilities including video-conferencing system, digital library, computer & science labs and classrooms, this was stated by AIOU vice chancellor, Prof. Dr. Nazir Ahmed Sangi while inaugurating new campus building in Abbottabad on Wednesday. It is the twelfth AIOU academic building constructed during the last three years for providing access to quality education and electronically connecting students with the university’s main academic network. Prof. Sangi urged philanthropists and the public representatives to help in acquiring suitable land for the construction of the AIOU infrastructure. “We can start the construction as soon as suitable land is made available on volunteer basis,” he said adding that necessary funding for this purpose could immediately be provided. He also urged the general public to help the university in establishing open-schooling System in the country. The AIOU has planned to set-up one hundred thousand open schools in the country within the next five years and for this purpose it will seek services of about ten thousand tutors and trained students to educate the male and female population at the primary and middle level. A reasonable stipend will also be provided for this purpose. The Open Schooling System inaugurated by President Asif Ali Zardari last week will lay a strong foundation for improving literacy rate in the country and providing excess to quality education across the board. He announced that AIOU’s study centres would soon start working in Kohat and Batagram. The university’s building for its regional campus in Mianwali has almost been completed, whereas its buildings in Khudabad, Methi in Sindh will also be completed within the next six months. The university has already acquired free land in Bannu, DI Khan, Lakki Marwat and Mardan where the construction work will start soon. The construction work for the AIOU’s own buildings is also in progress in Lora lia, Noshgi, Mastung, Mandi Bahauddin, Toba Tek Singh, Kalat, Jhang, Gawadar and Sibi for running its study centres. Colleges and universities are indecisive, slow-moving, and vulnerable to losing their best teachers to the Internet. That’s the shared view of Google (GOOG) Executive Chairman Eric Schmidt and Anne-Marie Slaughter, a former Department of State official and until this month a tenured professor at Princeton University. They explored the problems of higher education on Friday in a one-on-one conversation sponsored by the New America Foundation, where Schmidt serves as chairman and Slaughter is the new president. Colleges have the luxury of thorough, democratic deliberation of issues because “they never actually do anything,” Schmidt said during the event. He cited Princeton, where he graduated in 1976 and once served as trustee, which spent six years deliberating over whether to change its academic calendar—and in the end did nothing. “Don’t get me started on that,” Slaughter laughed. STORY: Seriously, How Much Did You Learn in College? Schmidt was more positive about the un-Princeton-like Khan Academy, on whose board he serves. He said the academy, which offers free online video tutorials on dozens of topics, has begun to analyze students’ answers to figure out which questions do the best job of assessing mastery of a topic. The Google boss also had kind words for EdX, a nonprofit created by Harvard University and the Massachusetts Institute of Technology that lets students take “interesting, fun, and rigorous courses” for free. Google and EdX announced this week that the tech giant will host a platform called Open EdX in a bid to make it easier for anyone to create online courses. “The fun will start,” Schmidt said, as new ventures smash up against incumbents that resist change. Abdul has successfully ranked hundreds of keywords in Google without any backlinking strategy. He is in the SEO and online marketing industry since 2009. Apart from SEO and marketing, he loves web development. WordPress is the core platform which Abdul has been using for creating top notch websites over the years. Abdul has established several successful startups such as OnlineTuting (An elearning system), OnlineUstaad (The largest hub of Urdu courses), Wali Solutions (Provides A to Z web solutions). He is one of the top Udemy Instructors with 45,000+ students and 1900+ reviews. He engages with students on Udemy in real time and answers questions within minutes. If you have any question in mind then don't hesitate to ask Abdul via private message. Abdul Wali, an inspirational Pakistani Biryani vendor has used the internet to transform his whole life. He is now one of the top instructors on online learning platform, Udemy, as well as a founder of his very own teaching platform, among other things. Abdul Wali was born in FATA to an underprivileged family. While other kids went to school, Abdul Wali started working as a cosmetic seller at the tender age of seven. Then he moved to Peshawar, selling shopping bags and toys and then later on to Lahore. After moving to Peshawar, Wali started selling shopping bags and toys and later on, moved to Lahore. Wali moved to Karachi in 2000. From there on, he spent his time working as a fruit and vegetable vendor and then a biryani vendor until he finally bought a mobile shop in 2008. He spent the next couple of years learning about computers. In 2010, he found out that one could earn money through the internet. He did some research on his own and started working as an instructor. “In the start, I used to earn in thousands; ten thousand, twenty thousand or even fifty sometimes,” said Abdul Wali. Last year, he claims to have earned over $100,000 (over 1 crore Pakistani rupees), just from teaching on the internet. “The good thing is that I never stopped learning. I try to learn every day,” he added. Abdul Wali spent a good part of his money in buying new courses and learning new things over the internet. Currently, Abdul Wali claims to be one of the top instructors on Udemy, one of the most popular online learning platforms on the internet; founder of his own online portal Online Ustaad, an online hub for tutorials in Urdu; and the CEO of Wali Web Solutions, his very own web service provider. Online education programme - tele-education - has been launched in 14 districts of the province under which the students of grades-4 and 5 would be taught English, mathematics and science subjects online. For the purpose, 150 schools have been selected where 16,000 students would be imparted education. “Sixty percent of the students taking benefit of the programme are girls,” said Zulfiqar Ahmad, managing director of the Elementary and Secondary Education Foundation (ESEF). The programme has been jointly launched by ESEF, DFID, Pakistan Poverty Alleviation Fund (PPAF) and Tele-education Organisation. It is being launched in Peshawar, Charsadda, Swabi, Nowshera, Mardan, Mansehra, Abbottabad, Swat, Dir, Chitral, Bannu, Dera Ismail Khan and Lakki Marwat. The official said the computer labs would be established in the schools where the online classes would be arranged. Teachers sitting in Islamabad would deliver online lectures at the schools. He said the programme had already been launched in some areas of Chitral, Dir and other districts and within a short span of time the interest of the students had increased. The official said monthly monitoring of the programme is done and the students have shown enough improvement in the subjects they are taught online. He said the curriculum of government schools is taught in the online classes. The official said in some schools of Chitral and Dir Lower, the project has already been completed and due to the successful results, it has been extended for another two years. The project continued for nine months in different schools in Chitral. Pakistan's Shale Gas With US & KSA Help?